When you're in a business that caters to holidays your "holiday season" begins way ahead of everyone else's. I begin creating and marketing holiday ties at least five months before the arrival of that holiday, so when I was asked to do a review of Clued In Kids Thanksgiving Treasure Hunt and Christmas Treasure Hunt in a Greeting Card it didn't seem odd at all and I was excited, even though it was only September. Cause that's how we roll around here. 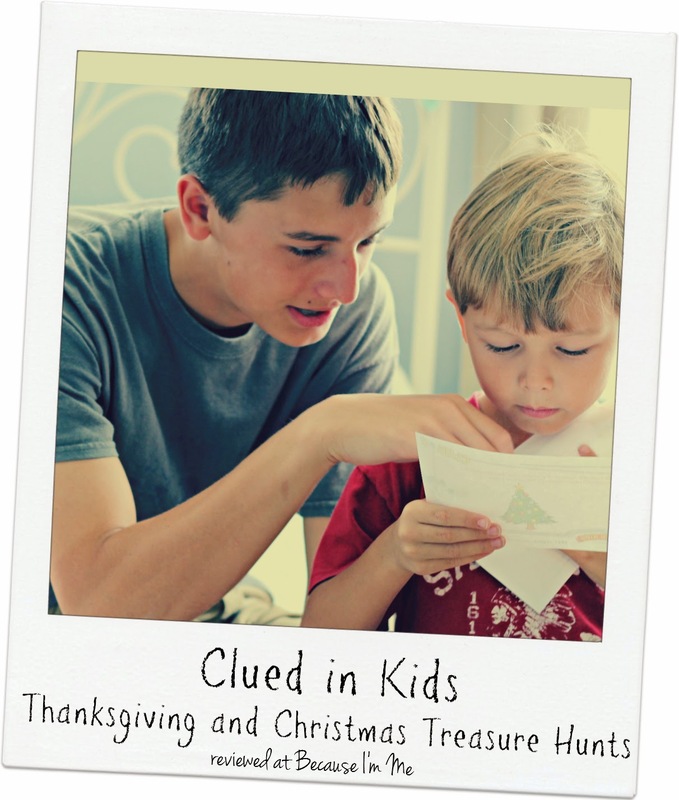 Clued in Kids offers over 20 different treasure hunts, from holidays to nutrition and more. Helen, the creator of Clued in Kids, is a huge treasure hunt fan, believing that these hunts are a fun, memorable, active way to learn. The Thanksgiving Treasure Hunt is a downloadable hunt. After printing the full-color pages the parent or leader cuts them in half, to create 12 half-page clues. Each clue tells the parent where to hide it, and then where to hide the treasure hunt prize, which can be anything the parent wants it to be. 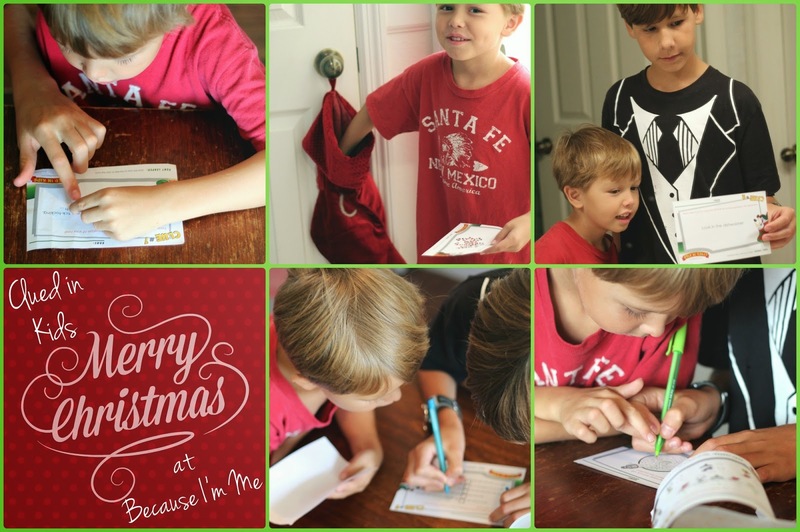 The Christmas Treasure Hunt in a Greeting Card arrives in the mail, making for twice the fun - what kid doesn't love to get mail?! The envelope is decorated as a full-color treasure box. Inside is another envelope containing the clues, two pages of temporary tattoos, and a sheet of simple stickers which I used to seal the clues after rolling them up. Each clue clearly tells the parent where to hide it, and hiding takes just a few minutes (the hardest part is hiding them without them being discovered too soon). Ok, truthfully the hardest part is getting the house clean enough to be photo ready, the sun to shine, and hiding them in a good place ... this whole blogging and photos thing isn't always a piece of cake! Once the clues are hidden the children get to work. I asked River (age 5) to choose two siblings to help him in his hunt because he's not a strong reader yet, while the treasure hunt is perfect for a five year old he needed a little extra guidance to read the clues. For the second treasure hunt two other sibling helped him out. The kids got along so well while doing this - no fighting or bickering for a whole 20 minutes or so. Each clue has a space to write a name for the person responsible for solving the clue and finding the next clue. I was able to designate the harder clues to the older kids, especially Adam (13) and Kaden (11), which made things much easier all around. On many of the clues I wrote all their names which led to some good teamwork. 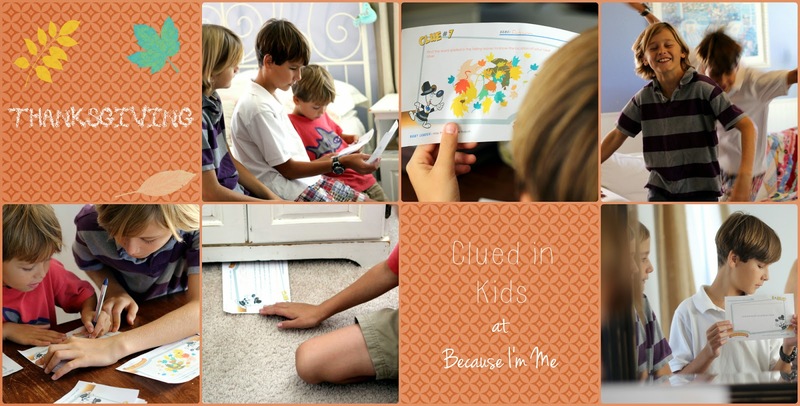 When it came to finding the clues they opted to take turns or, when things got tough, work together. Some of the clues in the Thanksgiving hunt include solving math problems, filling in history answers, and answering questions about Thanksgiving. In the Christmas hunt are clues that also require math knowledge. Both treasure hunts also include fun, easier clues like "Stand on your front doorstep, hold your belly like Santa, and in a booming voice say "Ho, Ho, Ho! Merry Christmas"", "Look in the dishwasher" written backwards so the kids have to hold it up to a mirror, and "Run around the house three times, flapping your arms and gobbling like a turkey", perfect opportunities for the younger kids to be as actively involved as the older ones. These were so much fun! The kids loved their treasure hunts and loved finding the clues. The clues do vary in difficulty, giving everyone something to do in the game, and are diverse enough to maintain the interest of the older kids. Each treasure hunt took about 20 to 30 minutes, depending on how well the clues were hidden. River especially loved the Christmas treasure hunt because it came in the mail and came with tattoos, and we agreed that this would make a terrific Christmas gift for friends his age. The Thanksgiving hunt, it was decided, would be just the right thing to do after the Rose Parade and before Thanksgiving dinner. These Clued in Kids Christmas Treasure Hunt Gift in a Greeting Card and Thanksgiving Printable Treasure Hunt are available at Clued In Kids for $9.95 and $5.99 respectively and are geared towards kids and grown-ups aged 4 and up.